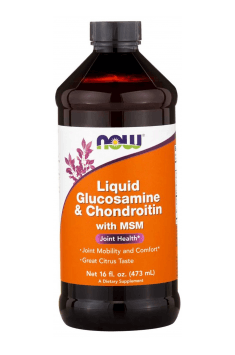 Liquid Glucosamine & Choindroitin with MSM is a dietary supplement that contains ingredients which support healthy connective tissue. The formulation includes substances that protect the joint cartilage. The supplement is in a liquid form and has a pleasant citrus flavour. Glucosamine HCl, choindroitin (sodium chondroitin sulfate) and MSM (methylsulfonylmethane) improve the regeneration of the joints which are the most vulnerable to strain. The product is additionally enriched with vitamin C and manganese (from amino acid chelate) which are necessary for collagen synthesis and responsible for proper function of connective tissue. Osteoarthritis causes a gradual deterioration of the cartilage condition which occurs with age. An increased incidence of degenerative changes in joints is observed currently, which are associated, inter alia, with More obese people and gradual ageing process of the population. These changes cannot be avoided. However, we can slow down their pace, so it is important to provide proper supplementation. Glucosamine is a substance naturally occurring in the body which is found in the cartilage and synovial fluid. This compound stimulates the biosynthesis of glycosaminoglycans and proteoglycans by chondrocytes (cartilage cells) which are an extremely important constituent of cartilages. It also promotes the production of hyaluronic acid by joint capsule cells. Furthermore, it is a component of collagen which is responsible for the elasticity of connective tissue in joints and cartilages. The mechanism of action of glucosamine has not been fully discovered yet. It has been demonstrated that glucosamine is embedded into the chains of glycosaminoglycans by chondrocytes and contributes also to inhibiting the activity of enzymes responsible for the breakdown of joint cartilage. In addition, it has been observed that glucosamine can relieve symptoms of osteoarthritis. Osteoarthritis is an incurable joint disease with progressing degenerative changes which result in physical disability. These changes are underlain by abnormal degeneration and regeneration process of joint cartilage — repair mechanisms are impaired and chrondocytes have difficult access to damaged parts of cartilage. It has been shown that glucosamine improves repair processes and promotes regeneration. Glucosamine helps to reduce pain related to the degenerative disease. The reduction of knee joint pain and improved mood have been observed in participants of the studies conducted in this field Moreover, there has been a reduced need for analgesics. Chondroitin is a polysaccharide which is a component of the matrix of connective tissue. The substance is responsible mainly for the synthesis of proteoglycans. Chondroitin sulfate is decomposed in physiological conditions. This process is necessary, inter alia, in order to replace the damaged structure. However, this mechanism is sometimes disrupted and degeneration process may intensify, causing thus adverse effects. This phenomenon may be triggered for instance by an inflammation in the area of joint cartilage and is associated with the secretion of enzymes causing the degradation of cartilage structure. Chondroitin sulfate prevents effectively this process by inhibiting the activity of enzymes triggering degradation. In addition, it helps to increase the viscosity of joint fluid, reduces friction between the joints, which consequently reduces pain and relieve symptoms of joint inflammation. The best effects were obtained when chondroitin sulfate was administered with glucosamine. MSM (methylsulfonylmethane) is an organic compound of sulphur which occurs naturally in the body and can be obtained from food. This substance has a significant role in the synthesis of amino acids, enzymes and glutathione. MSM is involved in the production of collagen and elastin and that is why it supports the structure of tendons, ligaments and muscles and improves the condition of the skin, hair and nails. Furthermore, it promotes the regeneration of joint cartilage tissue and contributes to reducing inflammatory process. MSM also strengthens the protection of cells against excessive free radicals. Vitamin C is incredibly important in collagen synthesis and is responsible for proper function of connective tissue. The role of vitamin C is especially noticeable in the case of deficiency which is manifested by muscle, joint and bone pain as well as impaired regeneration and slow wound healing. Manganese is element which supports the functioning of connective tissue, in particular bone tissue. This mineral also helps maintain healthy bone structure. Manganese deficiency is manifested by impaired coordination, osteoarticular disorders and may also be the cause of osteoporosis. To sum up, Liquid Glucosamine & Chondroitin with MSM is a dietary supplement recommended to people at higher risk of damages to joint cartilage and whose joints are overstrained — the elderly, obese people, athletes and workers taking hard physical effort. The product improves the comfort of mobility and quality of life and is well-tolerated by the body. Take 1 tablespoon (15 mL) twice daily. Shake well before use. Refrigerate after opening to preserve flavor. A usual daily dose of chondroitine is 0.5-4 g whereas the dose of glucosamine is 300-500 mg taken in three doses a day, preferably with food. According to scientific studies, the combination of glucosamine and chondroitine shows much better results and can effectively protect joints. It is recommended to start supplementation at the early stage of knee osteoarthritis to slow down the progression of the disease.